Infinite hol with high SWL capacity. Up to 4 units can be run from 1 power pack. 110v/415v petrol power pack options. Works in any position, horizontal, vertical, at any angle. Safe working loads from 800kg to 3.2t. Any height of lift, length of pull. Load held by specially designed jaws at all times. Operating levers move in relation to rope movement providing precise control. Shear pins to prevent overloading. We supply other makes of leaver hoist and can repair, service and test all makes in our workshop. 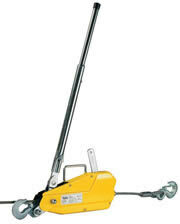 The lifting and pulling power of cable pulling machines can be greatly increased by the use of multiple sheave blocks. These can increase the nominal capacity of the Tirfor machine by 2, 3 or 4 times or more (see diagram). For most applications, an allowance must be made for friction in the sheaves. Ensure that the capacity of the blocks, fittings and anchor points are suitable for the load. When using the Tirfor for pulling purposes it should be remembered that the necessary pulling effort is not equal to the weight of the load to be moved.